Noncompetes have become a hot topic in the news and, concomitantly, have resulted in increased legislative scrutiny. Much of the controversy has focused on two things: One, their abuse – i.e., some companies use them indiscriminately, all the way to entry-level positions – which has served as a lightening rod for noncompete reform. And, two, a comparison of California’s Silicon Valley to Massachusetts’ 128 corridor. As to this latter focus, the argument against noncompetes is essentially that Silicon Valley became the epicenter of the tech industry in large part because of California’s ban on noncompetes, which advocates claim permitted greater employee mobility and, with it, greater transfer of technology. While the argument sounds compelling, the data is simply inconclusive; there are myriad other factors that can help to explain the rise of Silicon Valley, including the difference in cultures, the decision in the 1980’s to focus on developing PCs (which was rejected in Massachusetts), and the reality that with each “luminary” that moves there, more are drawn. The upshot is simply that the actual impacts are far from clear at this point. 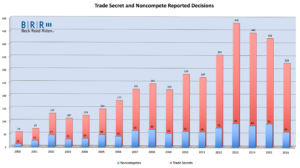 I have always believed (based on anecdotal information and experience) that, along with greater employee mobility and (presumed) greater technology transfer resulting from the limited enforcement of noncompetes would come increased trade secrets litigation. Specifically, I have believed that without a meaningful ability to enforce noncompetes in California, litigation over the (unlawful) transfer of technology (i.e., trade secrets) would be the focus and therefore partially supplant noncompete litigation. 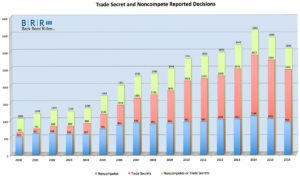 Recently, I began wondering whether, following the California Supreme Court’s 2008 landmark decision in Edwards v. Arthur Andersen (in which the California Supreme Court rejected the “narrow restraint” doctrine, which some of the courts – primarily federal – had developed to permit the enforcement of narrowly-tailored noncompetes), there would be a drop off in noncompete litigation in California and a corresponding increase in trade secrets litigation. So, I ran the numbers. 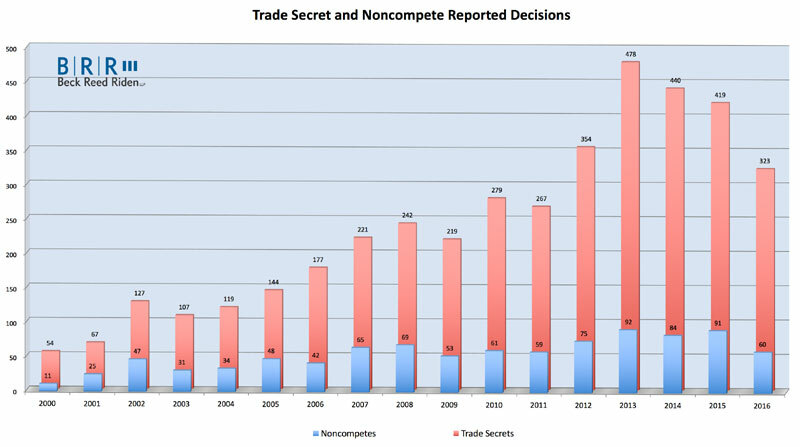 The chart to the right shows the results, i.e., a back-of-the-envelope analysis of the number of reported trade decisions and noncompete decisions issued by California courts (state and federal). As background, as readers of this blog know, each year, I run a similar calculation of the number of reported noncompete and trade secret decisions nationally year over year; the latest numbers (run in May) are available in the chart at the top (and here). For the California-specific chart, I essentially performed the same analysis, but limited it to California. Note that the closer the data is to the present (i.e., the right side of the chart), the less complete it is. This is because of the way the database populates over time. As a result, when I update the numbers next year, you should expect that the number of reported decisions in each of the two most recent years will increase significantly. First, to my surprise, the number (and trend) of noncompete cases seem (largely) unaffected by Edwards. It appears that part of the explanation for the continued noncompete litigation in California is that Edwards left open the door to using the protection of trade secrets as a basis to enforce noncompetes. Courts, particularly the federal courts in the Northern and Central Districts, have used this exception to enforce customer nonsolicitation agreements (which, albeit different, California treats as noncompetes). Another thing to note (as reflected in the chart to the right is that California decisions represented 8.5% of the total nationally in 2000 and 19% in 2013. (Note that by 2002, the percentage had jumped to 15.8% and has generally hovered in the 13 or 14% range.) 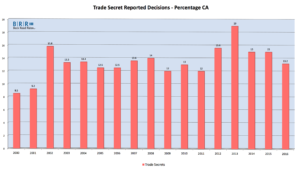 Consistent with these numbers, running a few specific comparisons (New York, Texas, Illinois, North Carolina, and Massachusetts), the number of reported trade secrets decisions in California is significantly higher than in any other state. I will leave it to the economists and academics (Matt Marx, Evan Star, Norm Bishara, and others) to determine the full significance of these numbers. 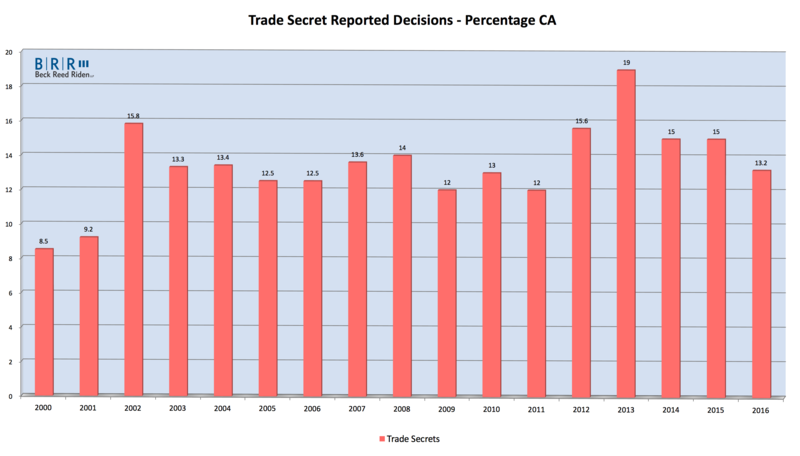 My take is simply that California uses trade secrets litigation as a proxy for noncompete litigation – which even following Edwards, is anemic, albeit not nonexistent. The takeaway is, as Evan and Norm observed, more research is needed to make empirical-data based policy decisions. At this point, any such decisions would be based on incomplete information. To be clear, this is not to say that there are no legitimate policy points and concerns advanced on both sides of the debate (pro and con, though the cons usually capture the spotlight). There are. For now, however, any policy decisions will necessarily be based on whether legislators believe (philosophically) that noncompetes should or should not exist, rather than whether they are provably good or bad for the economy.